but if you have connected your Android device properly and already installed working USB Drivers so you will not face any problem . Universal Android Flasher is a “all-in-one” tool that lallows you to do many functions like, Fastboot functions, root and unroot Android devices, install APK files and create a splash screen or just change the boot animation. Important Note for Windows XP users – For using Universal Android Flasher software in window xp you may need to install “.NET Framework 4.0 or higher” first . 1.Fully Fastboot Flasher: It can Flash Boot,Recovery,System,Userdata,Radio Images and even Splash Images. 11.Full Backup/Restore: now possible for ICS 4.0+ devices-easy backup and restore. 12.Online NANDroid Backup: Clockworkmod compatible Online Nandroid Backup-Works on all devices-No need to switch off the device. Fastboot and ADB properly working drivers should be installed before using this program. Connect your device in Fastboot mode (for fastboot flasher) or in Debugging mode (for ADB flasher and Boot animation changer) . 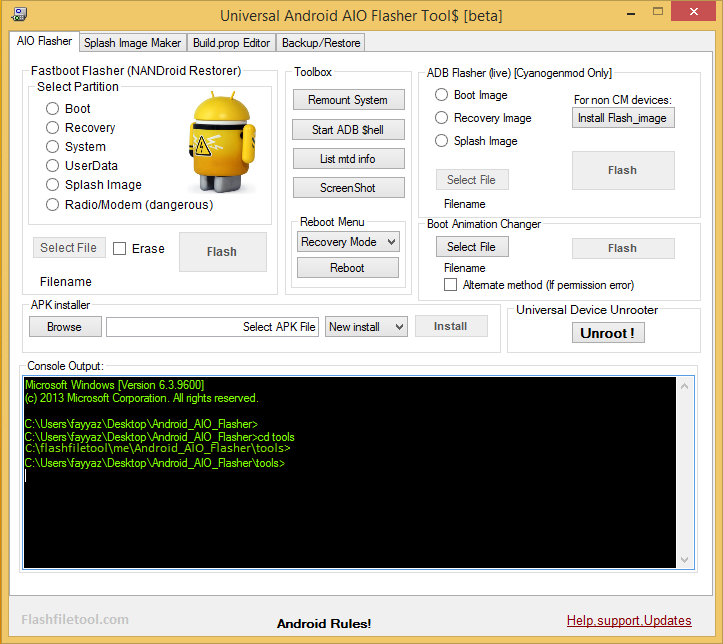 Now Download and open Universal android flasher tool . Splash image maker tab is for making boot animation image file . Now select the tab and option in which you want to process the function . Select the path of the file which you want to flash into your android phone . Wait for some time until and unless it show a successful dialog box .